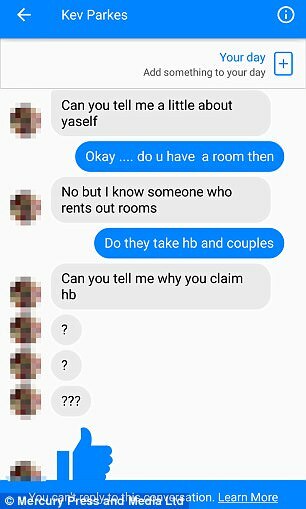 A disabled couple were sent shocking messages when they enquired about a room to rent in a shared house. 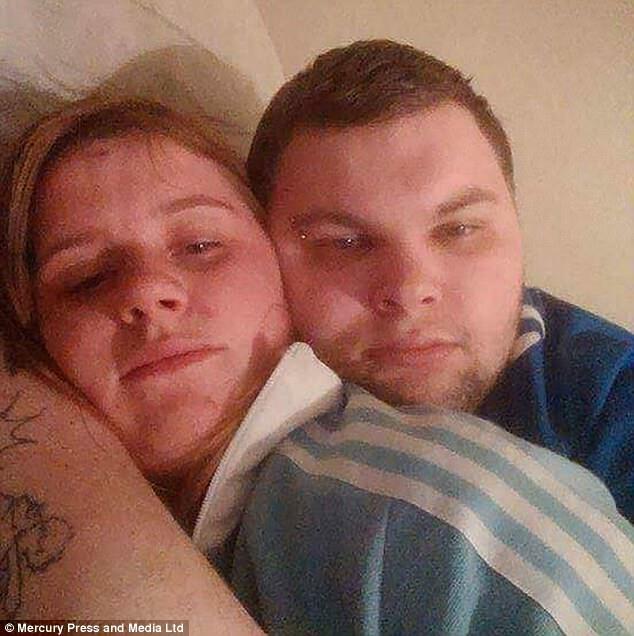 Maria Brindle, 25, and her partner Liam Bellis, 24, had asked the advertiser if he accepted tenants on benefits as they both have ill health. But after asking why they claimed benefits, Kevin Parkes told them to ‘get a job and stop sucking the life out of the country’. Maria has been unable to work due to severe back pain, while her boyfriend has Asperger’s syndrome, depression and anxiety. 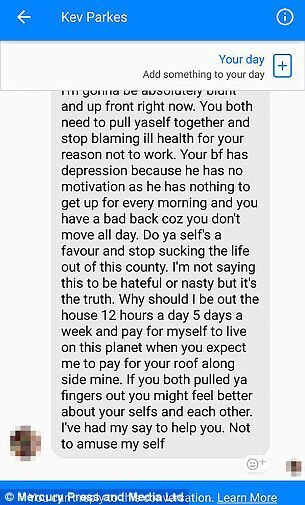 But Kevin claimed Liam, 24, has depression because ‘he has not motivation’ from not having a job and Maria’s bad back was because she ‘doesn’t move all day’. Maria, from Portsmouth, said: ‘He was asking about what we do for a living and I explained that we receive benefits. 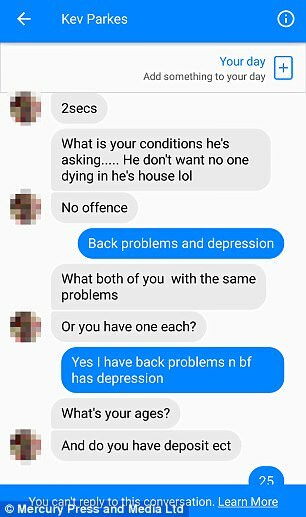 ‘When I told him, we received benefits as we were too ill to work he asked us if my partner was going to die in the house, which is a weird question to ask anyway. It was really strange. ‘I have been to the hospital and doctors so many times and they still can’t figure out what is wrong. I take painkillers every day. Some days I can’t even get out of bed. ‘My partner’s Asperger’s syndrome, depression and anxiety means that he can’t go outside and meet new people. He’s been told by the DWP that he can’t work. ‘I haven’t come across any more suitable rooms but I’m going to keep looking. No one will give us a chance. But Kevin, 32, defended his messages and claimed he refused to work 12 hours a day ‘only for them to ‘expect [him] to pay for [their] roof alongside his’. The dad-of-two said he refused to claim benefits when he broke his leg because ‘the country is struggling enough as it is’. 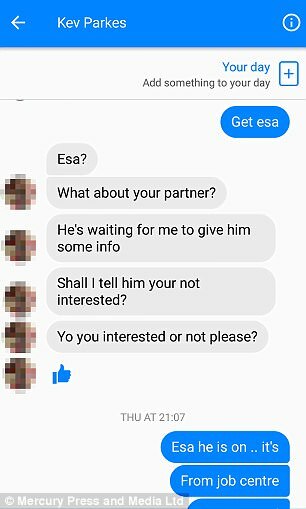 He had been advertising the property in Portsmouth for a friend and had been vetting some of the applicants to stop anyone moving in who ‘would not pay the rent’. ‘Many in this country don’t have the same work ethic as my mum or me or others who work hard their whole lives,’ Kevin said. ‘A lot of people can’t get off their arses and get to work. 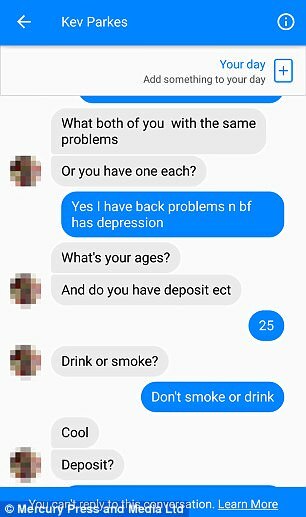 People are out there with genuine physical and mental health problems and that’s what the extra money is for. ‘But bone idle and lazy people shouldn’t have it. 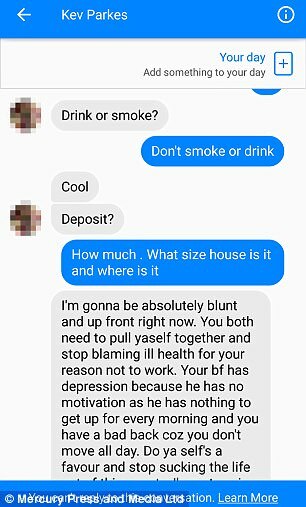 ‘My friend claims benefits and he has never worked a day in his life. He has seven children and he is still breeding. He says he will keep getting more money and so he will keep on breeding.